The Journeys Alternative Press Music Awards are coming July 17 and the nominations are in! This year brings two new categories—Best New Artist Video and Best Hard Rock Artist—and features a multitude of rock stars and fan favorites, as well as plenty of buzzing newcomers. It’s now up to you—the fans—to decide which artists will win a Skully! Voting is open now through June 30 at altpress.com/vote. The fourth annual APMAs will broadcast live July 17, 2017 from the massive Quicken Loans Arena in AP’s hometown of Cleveland, Ohio, hosted by Black Veil Brides frontman and Andy Black mastermind Andy Biersack (who is also nominated for Album Of The Year and Song Of The Year). Before the big event, fans can watch as their favorite bands and artists walk the red carpet in their best APMAs attire. Performances by All Time Low, Against Me!, Andrew McMahon In The Wilderness, Bone Thugs, Korn, Machine Gun Kelly, New Years Day, ONE OK ROCK, Pierce The Veil, The Pretty Reckless and Sleeping With Sirens have already been announced, with even more amazing performers to come! As fans have come to expect, rock’s biggest night will be filled with special once-in-a-lifetime collaborations from their favorite musicians. 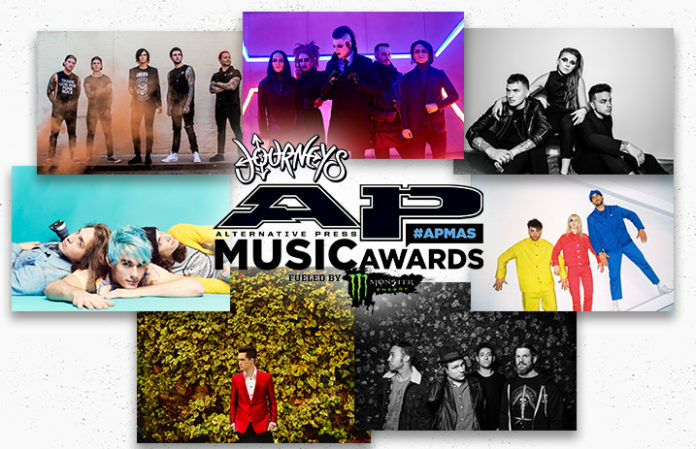 Tickets are officially on sale now at altpress.com/apmas along with VIP packages—including Monster VIP Table, Ultimate VIP and Premium Seating—that offer the best seat in the house.